Some people experience severe anxiety when it comes to seeing a dentist. At times, this anxiety can become so severe that it could be adequately labeled a dental phobia. Anxiety and fear about seeing a dentist can result in lack of necessary dental exams as well as delayed treatment that may result in considerable dental complications and health issues. For patients with extreme fear or anxiety or for patients with behavioral disorders that interfere with dental treatment, sedation options are available to help. Sedation dentistry offers a variety of options to patients to help reduce extreme fear and anxiety regarding dental treatments. Patients may choose from options that include inhaled sedative gas that induces a calming feeling while maintaining wakefulness, oral medications that are prescribed prior to an appointment to maintain a somewhat dazed wakefulness, and even intravenous general anesthesia so that you can be asleep during any necessary dental procedures. Our North Hollywood dentist takes your anxiety and fears seriously when taking care of your oral health needs. It is important to receive appropriate dental care for good overall health and wellness. Whatever sedative assistance you need to complete your appointment, we can help. Our cosmetic dentist in Beverly Hills can use porcelain veneers to correct a wide range of smile issues. Porcelain veneers can be tailored to your exact needs and can even be adjusted based on your gender, facial features, age and personal preferences. We will talk to you about your desires and goals and perform a comprehensive oral evaluation that identifies any dental health or cosmetic concerns before creating a treatment plan that addresses them. Porcelain veneers are wafer-thin shells of porcelain that are shaped like natural teeth and are bonded over the fronts of your teeth. They have a translucent surface and can be made to match your own enamel or your own preferred color for a brightened appearance. They can be used to correct multiple aesthetic flaws, including crooked teeth, widely spaced teeth, chipped teeth, worn teeth or severely stained or discolored teeth. They are stain-resistant, extremely durable and can last several decades when properly maintained. Veneers are also easy to maintain and can be brushed and flossed just like your own teeth. Contact our expert in porcelain veneers in Beverly Hills today to learn more or to schedule your consultation for porcelain veneers. When are Single Dental Implants Used? Dental implants are small fittings that are placed directly into the jawbone to act as artificial tooth roots that create a strong, durable base for prosthetic teeth to be attached. While dental implants are most commonly used as an alternative to bridges and dentures that replace multiple missing teeth, they are also great for replacing only a single missing tooth. A dental implant can support a prosthetic crown by itself, with no additional support needed from surrounding healthy teeth. This is unlike traditional replacement methods that require abutment teeth to endure the stress put on the replacement. A single tooth can be lost due to decay, periodontal disease, trauma or a variety of other reasons. When this happens, it is important to have the tooth replaced as soon as possible. If the gap from the missing tooth is left unfilled, the other teeth can begin to shift out of alignment which can cause further oral health issues. This shifting can also make it nearly impossible to replace the missing tooth in the future. If you are missing a single tooth and wish to have it replaced in the most natural way possible, contact our expert in dental implants in Escondido today to learn more about the advantages of such a procedure. 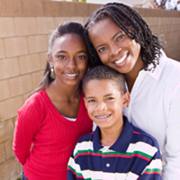 Teaching your kids good dental hygiene habits can be one of the most important things you do for them. Children who have good brushing and flossing habits are less likely to suffer from dental health problems that are linked to plaque and bacteria, such as tooth decay and gum disease. They are also more likely to retain those habits for a lifetime. Our North Hollywood dentist recommends that children have their first dental appointment by the time their first tooth erupts so that they can get to know us and feel more comfortable with every visit. About half of children between four and five are already suffering from tooth decay. Untreated dental disease can lead to poor school performance, problems sleeping and chronic pain. In fact, dental disease is responsible for more than 50 million lost school hours every year. Twice-yearly dental checkups can help catch early signs of these problems so that children can get the treatment they need before the condition worsens. We can also make recommendations about your child’s dental hygiene habits that can help them keep their teeth cleaner and healthier. Contact our pediatric dentistry office today to learn more or to schedule your child’s next appointment. Partial dentures are designed to replace one or several missing teeth. They are generally recommended if you still have some or most of your own natural teeth remaining. Unlike full dentures, which rest against your gums, partial dentures are designed to attach to your natural teeth using metal clasps. Our West Hollywood dentist can determine if you are a candidate for partial dentures. If you are a candidate for partial dentures, you may need two or more dental appointments to design and place them. At the initial appointment, your smile will be examined, and records such as dental impressions and X-rays may be taken. The shades of your teeth will be evaluated for a precise match to your new restoration. Once your partial is ready, you will return to have it checked for fit and appearance. It may need to be adjusted for a comfortable fit. Partial dentures that are bonded permanently to abutment teeth or dental implants are known as fixed dental bridges. These may be appropriate for patients who want a more permanent solution. Good dental hygiene will keep your smile healthy and your partial denture free of bacteria buildup. Contact our expert in dentures in West Hollywood today to learn more or to schedule your next appointment. Orthodontic treatments may be recommended if you have misalignment issues with your teeth or jaw. When you have misalignments, you may be more prone to damaged teeth, decayed teeth, periodontal disease and TMJ disorders. Additionally, straight teeth are often considered to be more attractive. Our dentist in North Hollywood can use either traditional braces or Invisalign to correct overbites, underbites, crossbites, open bites and other common orthodontic issues. Both braces and Invisalign use pressure to move teeth into correct alignment. However, the two options are quite difference. Braces use metal brackets and bands that are attached to your teeth, and wires that are attached to the bands and brackets are adjusted periodically to create the desired movements. Braces can be used to address a wide range of mild, moderate and serious orthodontic flaws, but they can be difficult to clean and uncomfortable to wear. Invisalign uses smooth plastic aligners. They can correct most mild and moderate orthodontic issues as well as some more serious problems. They are removable for easier cleaning, and every two weeks, they can be replaced to create the desired teeth movements. Although Invisalign is a popular and discreet alternative to braces, they may not be the best choice for every patient. Contact our expert in orthodontic treatments in North Hollywood today to learn more or to schedule your consultation.